I just had the opportunity to review the most recent release, Love Songs & Life Lines from Kris Lager Band and it's breezy and rhythmic. Opening with instrumental, Aurora Borealis, the band shows influences of world music with intricate guitar sounds by Lager, bass by Aaron Underwood and percussion by Scooby Sha Bo Bo. Adventuresome and soothing. Super ballad, I Wanna Hold You In My Arms has flavors of R&B and The Band. 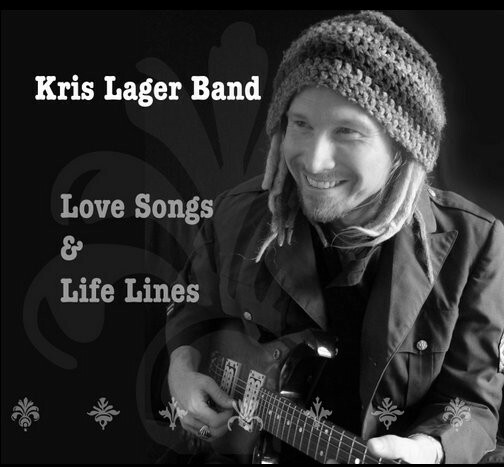 Lager's vocals are strong and his slide guitar adds nicely to the overall feel of the track. Very nice. San Francisco Bound is another strong track a good melody, slide guitar and sax by Lefever with trace sounds of Garcia and Van Morrison. Pickin' Up The Pieces is a bluesy, country flavored ballad. I like the general looseness of the track and blazing sax work of Lefever. Very cool! Another warm ballad, I'm Still Here And I Ain't Lettin' Go, features heartfelt vocals by Lager and Lefever's sax over organ a bed of richness. One of my favorite tracks on the release is I'll Be Thinking Of You, a descending chord pattern supporting a simple but effective melody. Very nice. Wrapping the release is Journey's Sonata, a tight acoustic guitar track. This is a smart closer to an overall very pleasing release.